Despite a title that might lead one to place it in the horror/sci-fi category, 2013’s The Invisible Woman offers a romantic historical drama. We open in 1883, where we meet Ellen “Nelly” Wharton Robinson (Felicity Jones), a drama teacher who appears haunted by her past – at least when the subject of famed novelist Charles Dickens arises. In earlier days, Nelly knew Dickens, but it turns out she enjoyed more than just a casual acquaintance with the author. From there we head back to 1857 and encounter Nelly as a younger woman. 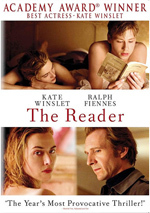 Along with her mother Mrs. Frances Ternan (Kristin Scott-Thomas) and sister Maria (Perdita Weeks), Nelly meets Dickens (Ralph Fiennes) because she will act in a stage production of his. Dickens immediately takes a shine to Nelly and they eventually enter into an affair. We follow this relationship in the 1850s as well as how it continues to affect Nelly in her later life. 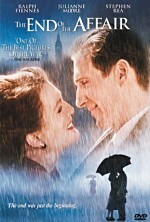 After the success of 1996’s English Patient, Fiennes took quite a few romantic leads. Invisible Woman takes us back to that period, though it brings us a twist, largely because the Dickens character creates a less dashing role than what we used to find from Fiennes – physically, at least. As portrayed here, Dickens comes across as engaging and charming, but the part downplays Fiennes’ handsomeness and makes him look fairly unattractive. Dickens also lacks the romantic charm of Fiennes’ other roles; while Dickens clearly can hold his own at the center of a room, he seems like an unlikely romantic lead. Perhaps that makes sense, as this becomes an unlikely romantic film, one without a whole lot of sizzle or energy. Which seems to be how Fiennes – in his position as director – wants it to be. Woman appears more interested in its existence as a reflection of the story’s era than as a real character drama, or at least that's how it seems to me. Despite all the time they spend on screen, we never get much of a feel for Nelly and Dickens, and the pace at which the movie pursues their relationship becomes an issue. Again, as a reflection of the Victorian era, I understand this. Given the morality of the period and the social positions of those involved, an affair would not have been entered into rapidly, so it makes some sense to allow that relationship to unfold gradually. But perhaps not this gradually. It becomes borderline water torture to follow the sluggish evolution of the Dickens/Nelly relationship, and we’re about 75 percent into the film before they finally succumb to their desires. This forces the plot to tear through the remainder of their time together with abandon, which seems like a bad choice; Nelly and Dickens spent more than a decade together, but the movie devotes most of its time to a small portion of that period. Honestly, I find the tale more interesting when it involves Catherine (Joanna Scanlan), Dickens’ wife. As depicted here, she presents the most compelling character, and the movie becomes more involving when she appears. Otherwise, Woman tends to be awfully dull. It supports excellent production values, as Fiennes nails the period details. It also comes with solid performances, as all involved perform their characters in a satisfying manner. Unfortunately, none of these positives can quite overcome the slow nature of the tale. At its heart, I believe the tale on display offers dramatic potential, but as depicted, the story moves too slowly and without enough depth to make it succeed. The Invisible Woman appears in an aspect ratio of approximately 2.40:1 on this Blu-ray Disc. Though not stellar, the transfer was usually good. Some minor issues with sharpness arose. At times, wide shots looked a bit on the soft side and lacked expected delineation. However, those instances were infrequent, so the majority of the movie appeared accurate and concise. I noticed no signs of jaggies or edge enhancement, and shimmering was absent. The film lacked print flaws and seemed clean. Many period pieces opt for subdued palettes, and that was true here. The colors tended toward amber tones, though occasionally we saw more dynamic hues, such as during daytime exteriors. These appeared fine within the film’s stylistic choices. Blacks seemed dark and tight, and shadows demonstrated good clarity. Though this wasn’t a great transfer, it was strong enough for a “B”. A romantic drama wouldn’t seem to be a candidate for a dynamic soundtrack, and the DTS-HD MA 5.1 audio of Woman fell into expected realms. That said, it demonstrated a bit more life than I expected. A few scenes – on the beach, at a racetrack, etc. – used the various channels well, and we got occasional speech from the sides as well. A train derailment provided a serious – and unexpected – sonic jolt as well. Usually the track remained oriented toward ambience, though, so don’t expect lots of sizzle from the mix. Audio quality satisfied. Although didn’t get much score, the music was full and rich, while effects showed nice clarity and accuracy. Speech – obviously an important factor here – appeared concise and crisp. Nothing here soared, but it all seemed positive. As we shift to extras, we launch with an audio commentary from actor/director Ralph Fiennes and actor Felicity Jones. Both sit together for this running, screen-specific look at story/character areas, cast and performances, sets and locations, costumes, production design and period details, camerawork and editing, music and a few other topics. Expect to hear one phrase often: "I love". Jones and Fiennes devote much of the track to the praise of everything involved with the film, and this grows tedious before long. We do get occasional useful nuggets, but we don't learn a lot in this dull conversation. Three video programs ensue. SAG Foundation Conversations with Ralph Fiennes and Felicity Jones goes for 26 minutes, 33 seconds and provides more info from that pair. They discuss story/characters/history, budgetary issues and production design, cast and performances, and related areas. Acting dominates the chat and helps give us nice insights. After the sluggish commentary, it comes as a relief to hear Jones and Fiennes offer stronger information about their work. On the Red Carpet at the Toronto Premiere lasts 16 minutes, 32 seconds and features Fiennes, Jones and producer Gaby Tana. Fiennes offers an intro before the screening, and then we get a short Q&A about the project. The session at the end offers a smattering of decent notes, but overall, the program lacks much meat. From the same event, a Toronto International Film Festival Press Conference runs 20 minutes, 59 seconds and involves Fiennes and Jones. They cover topics similar to those in the commentary and earlier pieces. This doesn’t mean identical information; some material repeats, but mostly we get new details. That makes this a fairly interesting chat, though it would’ve been nice to hear from participants other than Jones and Fiennes. The disc opens with ads for Tim’s Vermeer, The Lunchbox, Kill Your Darlings and Wadjda. We also get the trailer for Invisible Woman. A second disc provides a DVD copy of Invisible Woman. This includes the same extras as the Blu-ray. Based on a real-life affair that involved Charles Dickens, The Invisible Woman could – and should – have become a gripping romantic drama. Unfortunately, the choice to focus heavily on the affair’s gradual development forces the movie to progress at a terribly slow rate and robs it of much potential. The Blu-ray brings us good picture and audio as well as a smattering of moderately informative supplements. Woman has potential that it doesn’t usually fulfill.